Fast & Precision sectioning of large variety materials. Band Saw will minimize material loss that's always a concern when cutting deep inside cuts. Band Saw stands 17.5" tall. The work surface is 13.25" deep and 1.75" wide. Distance from the blade to the housing is 5 1/2" inches. This allows a substantial piece of material to be maneuvered freely on the work surface. The housing cover is removed from its track exposing the upper pulley of the blade. After blade replacement and/or adjustments are made the cover easily slips back into place. Samples can be safely hand fed into the blade with or without the standard specimen guide. The diamond plated, steel core blades are designed for long life under normal conditions. Easy blade access and replacement procedures, make occasional saw maintenance extremely simple. Coolant is contained in a reservoir at the base of the saw. 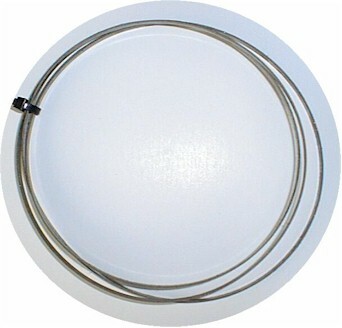 Made in U.S.A. Comes with one FREE Diamond Band Saw Blade (Electroplated) Nickel Bonded. Sample working area: 13.25" deep & 1.75 wide. Blade Range: 137" circumference, .020" wide, .140" deep. Dimensions: 18" x 14" x 12"
© Copyright 2002-2004. 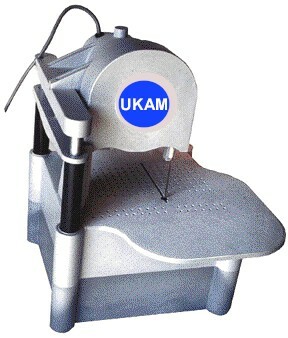 UKAM Industrial Superhard Tools. No portion of this web page or its designs, images, and logos may be reproduced in any form without written permission from UKAM Industrial Superhard Tools.